Album Info: For the Illinois Railway Museum's 60th anniversary it brought out 60 cars for operation and for display. Description: Cars 144 and 1374 await their turn to leave barn 7 to participate in the 31st Annual Trolley Parade. 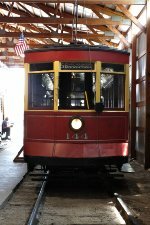 Description: Parade entry #1 - Streetcar built by McGuire-Cummings in 1924. Description: Parade Entry #2 - Interurban coach built by St Louis Car Company in 1924. Description: Parade entry #3 - Highspeed interurban coach built by Pullman in 1931. Description: Parade entry #4 - Streetcar built by J. G. Brill Company in 1923. Description: Parade entry #6 - Streetcar built by Pullman in 1908. 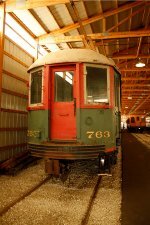 Description: Parade entry #7 - Streetcar built by St Louis Car Company in 1906. 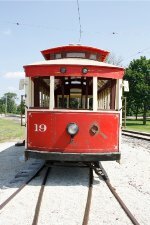 Description: Parade entry #8 - Lightweight Interurban coach built by Cincinnati Car Company in 1918. Description: Parade entry #9 - Open Streetcar built by Brill in 1914. Description: Parade entry #10 - Interurban coach built by Pullman Company in 1923. 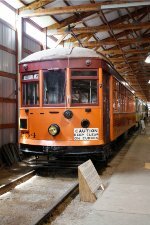 Description: Parade entry #10 - Interurban coach built by St Louis Car Company in 1945. 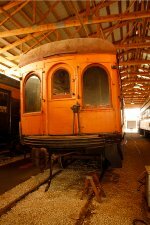 Description: Parade Entry #11 - Interurban coach built by Hicks Locomotive & Car Works in 1907. Description: Parade Entry #11 - Interurban coach built by John Stephenson Car Company in 1903. Description: Parade Entry #11 - Interurban coach built by Niles Car & Mfg Company in 1906 & Jewett Car Company in 1914.